A-B 24/7 offer a professional urgent delivery service for any goods that need to arrive that same day, (or even that same night). With our wide range of transport vehicles, we can transport anything from paperwork, IT equipment, large format graphics Legal documents. From our Wimbledon SW19 depot, our fleet covers the whole of London as well offering full UK coverage. When you need to ensure your delivery arrives without delay contact our team for details of our priority courier service, we will go directly from pick-up to drop-off and take care of your goods. We do not use networks – the driver that collects is the driver that delivers… transparent prices – the price we quote is fixed and guaranteed, the only extra charge if you are not ready when we arrive and would like us to wait… outstanding customer service – we look after our clients as well as their goods. Your Goods are Insured – we offer £20k goods in transit insurance as standard, (this can be increased if required). Specialist urgent delivery services – our team are trained in handling fragile goods and securing items in transit. Large and Bulky items – we have vehicles with tail lifts, vans with ramps and a range of vehicle types. No Account Needed – we accept all major credit cards. We are here 24/7 – if you are working late and need to ensure something arrives first thing in the morning our team are here whatever the time of the day or night. Collection time will depend on pick-up location, but our despatch team will advise you pre-booking. If it’s important to you, it’s important to us. Whether you need reports, contracts, legal documents, tenders, transactional documents, financial documents or anything delivered speak to our priority courier team. We are the trusted same day transport team for many organisations. If you have any special requirements for your delivery, just let us know. We track all our vehicles from our Wimbledon, SW19 Head Office, so we know where your important documents are and any traffic issues en-route. Our driver can obtain a signed proof of delivery by the recipient, or a particular contact, (details must be supplied on booking). Our team can also confirm delivery to the sender directly if required. We can use one priority courier vehicle to make a series of collections and deliveries or alternatively we can use one vehicle to make a series of collections and deliver in one vehicle. Speak to our team to discuss your requirements, and we will advise you of the best logistics solution. We also offer overnight storage allowing collections to be made during one day and delivered the next. When it needs to go directly to the recipient, we’ll send a vehicle to make a priority delivery, and your item will go straight from pick-up to drop-off. Priority deliveries need to be ordered on booking. A-B 24/7 offer more than just a courier service, we’ll keep you up to date on your items progress and notify you when delivered if required. We don’t offer overnight delivery services and neither do we use distribution networks. The driver that collects is the driver that delivers and will look after your goods in transit. With our range of urgent priority courier vehicles we can transport large and bulky items, not sure which vehicle would be suitable for your item? Just speak to our team. You need to be assured that the courier team that is transporting your goods is going to look after them at every stage of the journey. The A-B24/7 driver that collects will transport your item to the delivery location, eliminating the risk of unloading at a depot and then transferring to another vehicle with other consignments. Transportation of fragile goods can be more involved than that of other consignments, and we can advise on packing and logistic considerations to ensure safe, secure delivery, just call our office to discuss further. Premium goods need a premium service. 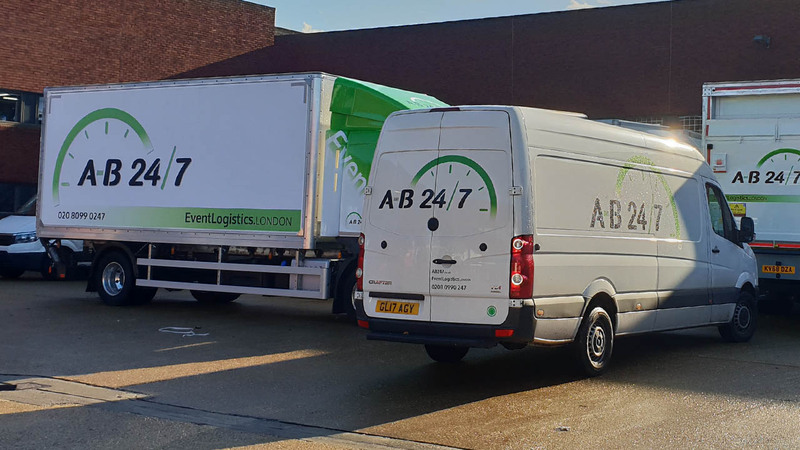 A-B 24/7 priority courier vans have extensive experience in transporting high-value items around London and throughout the UK. High value doesn’t have to mean monetary cost. Much of what we do here is the delivery of one-off projects where care, attention and the personal touch is required. Regardless of size or shape, we have the expertise to ensure a hassle-free delivery by sensitively handling your precious items.